At Honeydew Gardens we take great care in raising our animals humanely. Our animals are raised on pasture, with daily access to fresh air and sunshine, allowed to indulge in their natural foraging instincts, supplemented with non-gmo feed and kitchen & garden scraps. 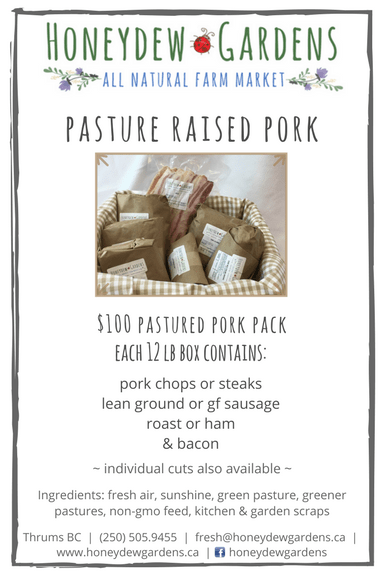 Try our Pastured Pork Pack, which includes a variety of cuts, or individual pork cuts are also available. It is government inspected and professionally cut and wrapped. To order, please call 250-505-9455, email us, or reach us on Facebook.